As regular readers know I've become a bit of a Johnny Cash nut. I listen to Cash all the time so as my sons ride in the car with me they hear a lot of Johnny Cash playing. My son Aidan sums up Johnny Cash like this. Aidan says, "Johnny Cash sings about trains, prison, murder and Jesus." That's just about a perfect description of Johnny Cash. In my series about the theology of Johnny Cash (see the sidebar on the blog homepage) I wrote about the prison, murder and Jesus parts. But nothing about the trains. Johnny Cash's first recording with Sun Records wasn't "I Walk the Line" or "Folsom Prison Blues." The first song Cash wrote and recorded with Sun was a song about trains. That song was "Hey Porter." "Hey Porter" needed a compliment song to make a record. Cash went off and wrote "Cry, Cry, Cry." "Cry, Cry, Cry" became the A-Side of Cash's first record and was his first hit. "Hey Porter" was the B-Side and also got a lot of air play. I'm stuck in Folsom prison, and time keeps draggin' on. But that train keeps a rollin' on down to San Antone. Just to hear the words the dying fellow said. To see my Rose and get to know my son. And don't forget to give my love to Rose. In short, beyond the debut of the happy "Hey Porter" the train songs of Johnny Cash tend to be sad and melancholy songs. Happiness is on the train and that train is leaving us or passing us by. We're left standing by the railroad tracks listening to the whistle in the distance. 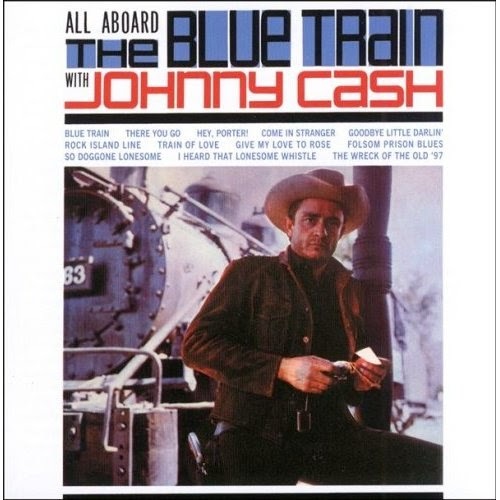 (By the way, if you'd like to explore many of the early train songs of Johnny Cash check out the "All Aboard the Blue Train" compilation album put out by Sun Records in 1962. It's one of my favorite Johnny Cash albums. I have it on vinyl and play this record in my office more than any other. Some interesting backstory behind this and other compilation albums put out by Sun Records. So the train song for Johnny Cash is a sad song. The train whistle is a sound of lament, loss and regret for the sinner sitting in prison for the poor man dying by the railroad track and for the lovers who are saying good-bye forever. I think it's theologically fitting that one of the last train songs recorded by Cash is "Down There By the Train." For me, the song reaches back to the start of Cash's career as the answer to the sinner's lament sounded in "Folsom Prison Blues." It is a song that brings the hope of reunion in "Hey Porter" to the man dying by the railroad tracks in "Give My Love to Rose." Yes, the train songs of Johnny Cash are laments, filled with loss and regret. But there is a place where the "train goes slow," slow enough for all of us in our sin and sadness to hop aboard and find our way back home.